Two of the most artificial lemon-flavored ingredients are featured in this recipe: lemon extract and lemon pudding mix. To add to that, there was also lemonade concentrate, so one would think this would be the ultimate lemon dessert. Alas, this was strangely bitter...not the lemony tangy-tart-sweetness I was expecting. The only true lemon "tang" in this recipe was from the lemonade concentrate, and it just wasn't enough. The lemon extract added an almost liqueur-like flavor, and the lemon pudding mix was just sweet...but not tangy. The pudding consistency of this tart was mainly from the pureed tofu, and that very subtle tofu flavor came through...making this even more strange. 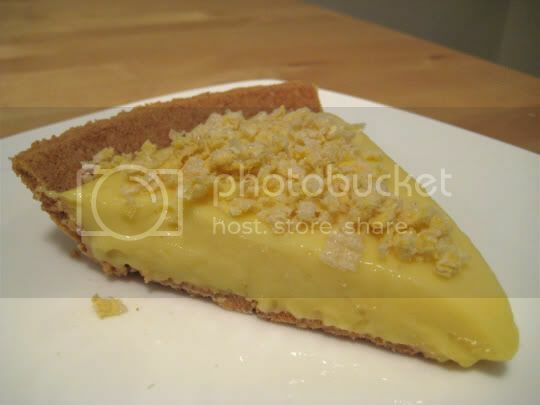 The savior of this tart was the graham cracker crust, which added some normalcy back into the flavor. Vanilla wafers were crumbled on top, adding a nice texture and sweetness. Although I wasn't crazy about this recipe, I did finish the slice...yet I ended up throwing the rest away. It wasn't BAD, but something about it just wasn't right. I don't want to taste bitterness when eating something lemon-based.